Two months to the day after I cast on, the Husband Sweater is off the needles and I love it! The fit is almost perfect. Next time I'll make the arms shorter by an inch or so, but other than that it's a knockout. I probably could have knit it in half the time if I hadn't had to rip from the shoulders back to the underarms. 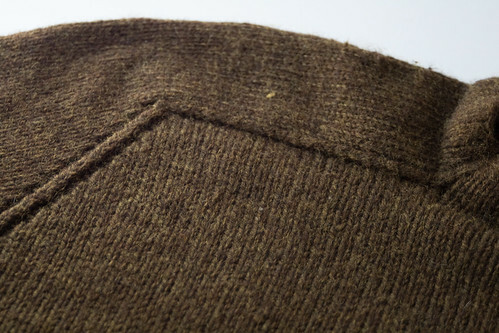 Then I reknit one of the saddles twice; I was a perfectionist with this sweater, I wanted it to be worthy of the Husband. Yarn: Cascade 220 in colours 9459 (the heathery tobacco-ish green) and 4002 (charcoal) for the inner cuffs. I think it took 5.5 hanks? Maybe 6. I can't find the original receipt, so I'm not sure how many I started with. Modifications: According to EZ's directions, I knit the t-shirt yoke. You knit one saddle, bind off half the stitches and continue knitting the half saddle across the back and graft it to the second saddle. It makes the back of the sweater a little higher than the front. You may remember that there was going to be a gray cross on the front as well, but I've scrapped it for now. I may duplicate stitch it in later on, we'll see. Final Verdict: I love it! The Husband has been wearing it since the photoshoot, so I'd say it was worth waiting for. The goal of NaSweKniMo was to complete a 30 000 stitch sweater in under a month. While I didn't finish the Husband sweater by the 30th of November at midnight, I came pretty close. I still haven't finished it, but I have knit more than 30000 stitches. I didn't work out the exact math, but I'm up over 37000. The progress you see here has since moved backwards a little. That intarsia cross in the center wasn't working for me; the scale was too small and due to a miscalculation, it was about 2 inches too high. I was also using a funky method for the colourwork that I wasn't particularly keen on. I would knit across the first row (stranding the green behind), drop the charcoal yarn and then continue with the green all the way around. When I got back to the charcoal, I slipped all the stitches across, turned the work and purled back, slipped them all across again and then joined a new strand of green. I knit the entire cross this way, weaving in the ends as I went to tighten up the edges where the stitches weren't joined every other row. It was working OK, but I wasn't thrilled about it. 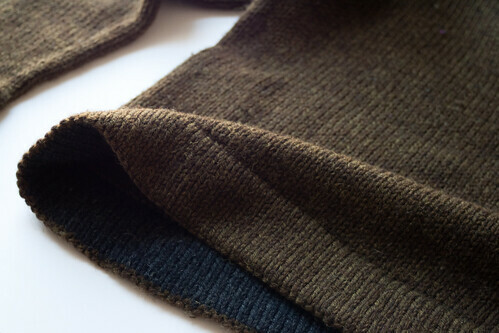 When I got to the point where I would start the saddle shoulders, I realized that I had 2 more rows of the cross to complete, with no rows left to knit on the body. There was only one thing left to do. Frog. I ripped all the way back to two rows above the arm join. I checked with the Husband about duplicate stitching the cross in afterwards and after getting a nod of approval, I began re-knitting without the intarsia. The frogging was painful, but only because I hadn't listened to that niggly "this isn't working" voice in the first place. Why didn't I heed my own warning bells? Since I began to knit, I've always been fascinated with folks who can knit without looking. I was always amazed at tales of people reading and knitting, watching TV and knitting (instead of just listening), or going to the movies and knitting. I knew it wouldn't be a tricky skill to learn, but the fear of having to rip back was always too great. Thankfully I'm over that fear now and I'm fairly confident that I can fix just about any knitting mistake. The first few times I had a go at it I kept glancing back down at my hands. Was I doing it right? Were my hands making the stitches correctly? Did I miss anything? It's like when you're rock climbing and you're have to push yourself backwards over the edge of the cliff before you belay down. There's that moment of "holy crap, what the hell am I doing?" and then once you're over, you're fine. Well, maybe it's not *exactly* like that, take out the physical danger and the over-the-edge feeling is the same. I've been practicing with the Husband Sweater and 624 square inches of stockinette later, I've got it down. I still glance every now and then to see where I am, but I'm officially ok with not looking to make sure my hands are executing a stitch I've done millions of times before. Seems silly that I ever worried about it when I think about it that way. Some folks have wondered what the Husband Sweater will look like, so I thought I'd share the official mock-up that I'm working from. Don't worry; my knitting is much better than my drawing. 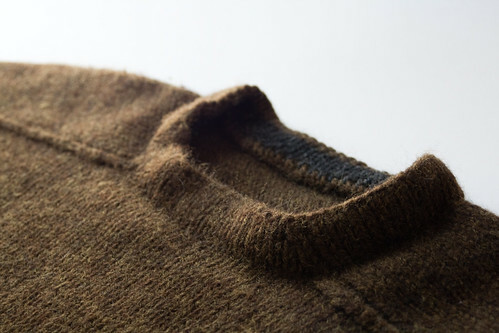 The Husband sweater, although it needs a better name, is flying along. I've successfully avoided Sleeve Island (hey Pixie, try knitting the sleeves first. That way you don't get stuck with a pile of almost-vests) and started the body this weekend. I'm going to try and finish it up by the end of the month, so I guess that makes me an official NaKniSweMo participant. I know I said originally that I was going to try and design this sucker myself, but I've decided not to. Everytime I sat down to work out the math or tweak some part of the cobbled together pattern I kept thinking that someone must have done this work before me. And better. And I was right. I decided to use the Elizabeth Zimmerman Seamless Hybrid pattern from Knitting Without Tears . I showed some pictures to the Husband and got immediate approval, so I'm taking the pressure off myself of having to create THE Sweater. The yarn is Cascade 220 in the imaginatively named colour 9459.